From the creators of the #1 desktop storyboarding software, comes our latest mobile app designed for filmmakers of every level compose shot ideas – on the go! 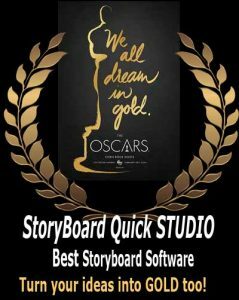 StoryBoard Quick Direct turns your iPad into a mobile pre-visualization tool that will allow you to create and show off your storyboards and cinematic ideas, wherever you are! And, as a bonus, import them into your laptop application and keep boarding. Take any photo to use as a location or when something inspires you, take a photo right where you are and use it instantly! Quick Direct comes with great-looking looking actors in multiple positions and rotations so blocking the shot is a snap. Even add your favorite characters from our desktop versions. Zoom-in, Zoom-out and add directional arrows to define the action or camera movement. Every frame has its own caption for director’s note or dialog. Type or dictate your dialog or comments using the built-in microphone and speech-to-text technology. Set the font, size, color and your captions can be visible during playback as well! Want to see your storyboards in motion? Just press play and watch your storyboard sequence playback on your mobile device. Set and save the frame duration, sit back and watch the show. View your entire project as thumbnails in the overview window. Rearrange frames with the swipe of your finger and jump to any frame in the sequence for additional editing. Upload to your desktop StoryBoard Quick and StoryBoard Artist! Now, you can even take your mobile previs and work on them in your copy of StoryBoard Quick or StoryBoard Artist. Upload your storyboards to your own cloud and open them right onto your desktop where you can substitute characters, add more elements, import your script and more. Quick DIRECT is a great tool for when the inspiration hits you when you’re on the go. Your cloud subscription will open the door to unlimited upload storage of your projects for easy access to your projects on both your desktop and your iPhone. Print directly from your app! Choose from preset storyboard formats just like your desktop version of Quick. 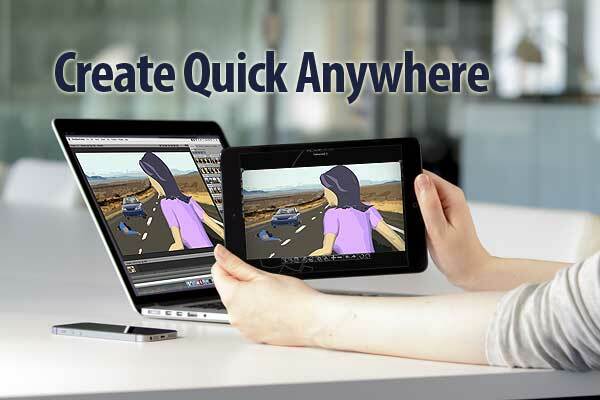 For unlimited options see our more advanced desktop application StoryBoard Artist 7. Choose from special character bundles and get all of our cool storyboard characters and extra Quick artwork, including props & locations now too. Layer them all into all your frames, export to pdf and send it to your cast and crew right from the app! I purchased the quick artwork on my mobile app however I don’t seem to have access to any artwork, props or locations. Please advise how to restore this feature i just purchased. The add-in artwork can be accessed on the left side of the frame window. Tap the icon of the chair to popup the props, and the house to popup the locations. Be sure to be in landscape mode when working to see all of your options.